The requirements for efficient distribution of ortophotography are ideally solved with the Image Server. The architecture consists of one central image server, many clients and an optional local image server, one for each LAN of clients. The local image server instantly caches images and the central server ensures that the data are consistent and up to date. Images can be transferred either via the Internet, physically via DVD/CD, or both. Clients access the local image server for images. If an image is not cached yet, it is straightforwardly loaded from the central image server to the local image server. The applied technology is similar to bitTorrent or other new generation P2P networks, which deal with the distribution of large data sets among many hosts. The essential feature of the Giselle Image Server, which similar systems lack, is management of both images and clients by the central server. Where a conventional architecture with independent clients installed on local machines would require maintenance, configuration efforts, license managements, etc., our architecture ensures that no local IT managing expertise and effort is needed besides setting up a normal PC, thus keeping down long-term costs, often neglected by other solutions that tend to disregard long-term aspects and user satisfaction. Other comparable solutions such as terminal-host and Citrix also suffer heavy network performance penalties during peak load (i.e. all local clients accessing the images), because requests are not distributed and parallelized and in turn require a larger available bandwidth, though it is idle most of the time. Even Citrix, which is optimized for screen transfer, must reload the complete image, if the pan operation is executed. 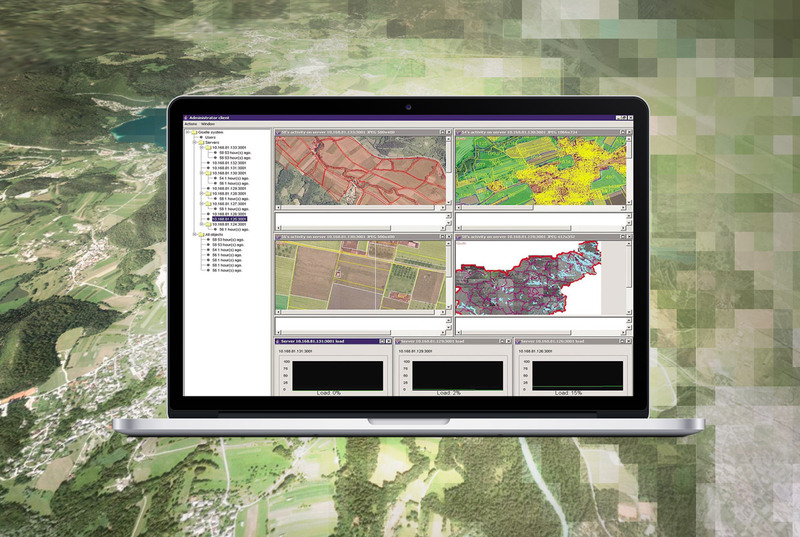 The presented design of the Image Server greatly improves performance of the system (compared to either accessing images from a central location or reading unprocessed images stored on local network file servers), while facilitating maintenance of the software infrastructure, as well as that of the orthophotographic images. It is possible to update images on a central location and the updates can automatically be distributed to local offices without the need of a local system administration.